Niles volume controls deliver sound to your speakers without getting in the way of the music. Niles volume controls deliver sound to your speakers without getting in the way of the music. While lesser components add pops, clicks and static, Niles brings you pure enjoyment. Their premium-quality parts and construction ensure high-fidelity sound with amplifiers rated at up to 100 watts per channel of continuous power. These in-wall stereo volume controls offer intuitive operation for your multi-room audio system. The high-power, impedance-magnifying design lets you safely connect as many as eight controls and eight pairs of speakers to a typical receiver or amplifier without installing a speaker selector or any other type of protection device. If your amp's minimum impedance is 8 ohms, you can connect up to 8 pairs of 8-ohm speakers using these volume controls. If your amp's minimum impedance is 4 ohms, you can connect up to 16 pairs of 8 ohms speakers, or 8 pairs of 4 ohm speakers. 2-3/4"W x 4-1/2"H (includes faceplate); depth behind plate: 2-9/16"
Very good and very reliable control. Overview: The VCS100K (FG01652) is a high power stereo speaker volume control that connects between the speaker-level output of an amplifier, speaker selector, or a Niles distribution hub and a pair of speakers. Premium-quality parts and construction ensure high-fidelity sound with flat frequency response and 100 watts continuous power handling. It is designed for indoor use only. Four Colors: The VCS100K installs in-wall in a standard single-gang junction box (J-box). 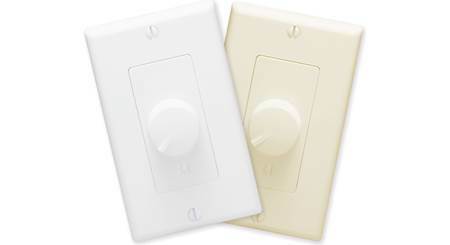 The package includes a Decora faceplate, insert, and knob in each of four colors: white, light almond, bone, and black. Selectable Impedance Magnifying Circuit: A universal impedance magnifying circuit enables the VCS100K to act as both stereo and an impedance magnifying volume control. You can magnify the speakers' impedance by a factor of two, four, or eight, allowing you to connect up to eight pair of speakers to a single amplifier or receiver. A sliding switch on the front on the volume control lets you set the impedance factor to 1x, 2x, 4x, or 8x. 12-Step Control: The rotary design gives 12-step control, and a total of more than 48dB maximum attenuation. The high-quality construction assures you get pop-free switching between all steps. Autoformers: Precision autoformers provide superior sonic performance, exceeding the audio quality of non-impedance magnifying volume controls. Removable Screwless Speaker Connectors: Two piece, screwless speaker connectors make installation quick and secure. Each connector can accept up to 16-gauge wire. Isolated Grounds: Isolated left and right-channel grounds ensure safety with any amplifier. Mounting: The VCS100K fits into most 18 cubic inch single-gang junction boxes. Impedance Compatibility: The VCS100K can be used with 4-, 6-, or 8-ohm speaker systems. Removable Insert and Knob: The Decora-style insert and knob on the VCS100K are removable, allowing you to substitute a different color insert and knob. Junction Boxes: The mounting depth of the VCS100K is 2-9/16". When installed, the unit extends 2-1/16" behind the sheetrock (assuming 1/2" sheetrock). For installation, you must use a standard 18 cubic inch or larger junction box. Speaker Wire: The VCS100K will accept stranded copper wire up to 16-gauge. Larger (lower gauge) wire is not recommended, as it will not fit into the connectors. Solid-core, aluminum, or "Romex" wire is not recommended. Most states require in-wall speaker wire to have a specific "CL" fire rating. Mounting Location: You can install the VCS100K in just about any location where in-wall space exists, though it should not be installed into a junction box with 110 volt devices, such as light switches or dimmers. Speaker wire can act as an antenna for electrical noise, and locating speaker wire too close to a light switch or dimmer may cause the speakers to emit a popping or buzzing sound. Required Tools: To install the VCS100K you will need a 1/8" standard slotted screwdriver, a 1/4" standard slotted screwdriver, and a wire stripper. Other tools may be required to prepare the wall and junction box to accept the volume control. Volume Control: W=1.532", H=4.066", D=3.421"
Can you use the knob to completely cut off sound to the speakers? 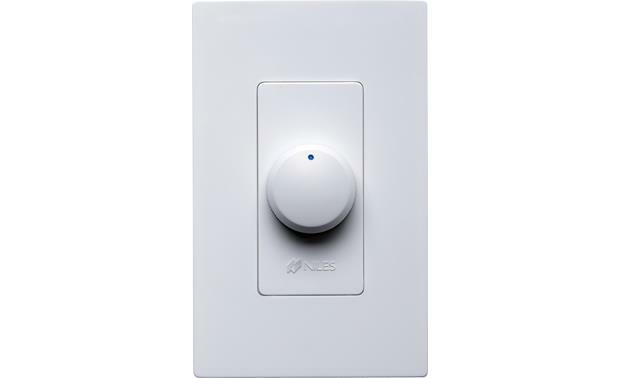 for instance if i had a pair of speakers in the bedroom and a pair in the bathroom with one volume control in each room, could i turn the dial all the way down or off if I just wanted to hear music in the bathroom? Yes you can completely shut off the sound. I have a similar set up. Not off but generally speaking so low you can't hear anything. If the volume from the receiver is at full volume you might hear something and I can't with my system. With multiple rooms and only some have the Niles volume control all sound great. Can I connect four 8-ohm speakers to this one attenuator? Yes. I am assuming you mean four speakers and not four speaker pairs. However the manual says this unit has capacity for eight speaker pairs. I only installed one pair of outdoor Klipsch speakers and the unit works great. I'm running four 8-ohm speakers to this same volume control. The connectors inside the volume control aren't really wide enough to accept two pairs of speaker wire to be connected directly to the volume control. Instead, you will need to connect one pair directly to this volume control unit, then connect the second pair of speakers in parallel to the first pair. Then follow the instructions for the correct switch setting for the total number of pairs of speakers you are running from your amp. If these are the only 4 speakers, then you will set the switch for two 8-ohm pairs. If you have other volume controls and speakers for the same amp, you will need to take those into consideration when setting the impedance matching switch. If I am running 1 pair or 2 speakers from the VCS100k, do I have to run 2 pairs from the amp to the VCS100k? Can this be used with a single mono speaker? Yes just connect to one of the terminals. As long as signal is mono coming in. The VCS100k is rated for 100 watts per channel. Does this mean that for a system with 8 pairs of speakers (8 VCS100k) you can have an amp providing 800 watts or does this mean that the entire system is limited to 100 watt amp? The 100W rating is for the speakers connected to the load side of the control: I.E.- the speakers in that room or area. I had about 8 "areas" and 8 switches all driven by a 1,000 watt (RMS) amp...just make sure you match the impedance to the amp or it'll overload it (The chart is confusing...call Customer Support at Crutchfield, they'll help you keep it straight). What is the difference between the Niles VCS100K and the VCS100R? I have several speakers connected to VCS100R controllers and I need one more. Is the VCS100K compatible with the VCS100R? Searches related to the Niles VCS100K Stereo volume control with impedance magnification.